You can display a report as one of several kinds of Microsoft Excel spreadsheets. The report opens in Excel within a web browser. Excel 2000 worksheet (format EXL2K). The Excel 2000 format supports most StyleSheet attributes, allowing for full report formatting. The computer on which the report appears must have Microsoft Excel 2000 or higher installed. In addition, WebFOCUS supports two Excel 2000 variations: EXL2K FORMULA and EXL2K PIVOT. When either of these formats is specified additional processing is done. Excel 2000 PivotTable (format EXL2K PIVOT). PivotTable is an Excel tool for analyzing complex data, much like WebFOCUS OLAP. Note that a report displayed as a PivotTable spreadsheet may not retain its formatting if you insert an additional field from the pivot cache, move a column position, or remove a field from the PivotTable. 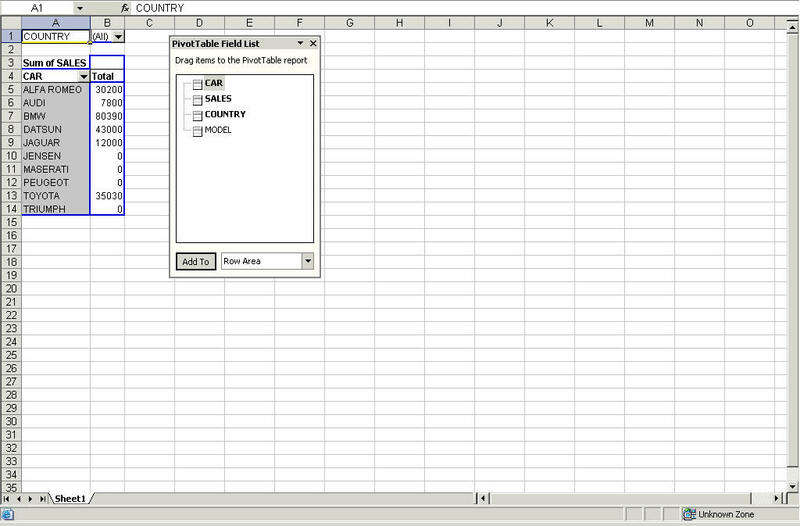 Excel 2007 worksheet (format EXL07). Excel 2007 enables you use the Microsoft Office Excel 2007 features with your report. Excel 2007 must be installed in order to run reports using the Excel 2007 output format. Excel 97 spreadsheet (format EXL97). Excel 97 is an HTML-based display format that opens in Excel 97 or higher and supports report formatting and drill-downs. The computer on which the report appears must have Microsoft Excel 97 installed. Note: Since only single line (single cell) column titles are supported in format EXCEL reports, any additional column title rows are treated as data. For example, if you have a report with a multi-line (multi-cell) column title and you sort the column, the second (and so on) column title rows will be sorted with the data. To avoid this, only select the data instead of the entire column when you select sorting options in Excel. For details about displaying reports in Excel formats, see Choosing a Display Format in the Creating Reports With WebFOCUS Language manual. After selecting the CENTCOMP data source to report against, open Report Painter. Type STORE NAME BY STATE in the heading area. Move the insertion point to the report and add the following fields from the Object Inspector: STATE, REGION, STORE_CODE, and STORENAME. Select the Store Name column and click the Sum button. Select the State, Region, and Store ID columns and click they By button. Select Format from the Report menu. The Report Options dialog box opens at the Format tab. Set your report output format to Excel 2000 by selecting Excel 2000 (EXL2K) from the Output Format drop-down list. In the Customize worksheet title field, type State Report. Click OK, then click Run. Notice that the tab name has been changed from the Excel default, Sheet1, to a more descriptive name, which you specified in the Customize worksheet title input field on the Format tab of the Report Options dialog box. The EXL2K format supports fonts that are available on both the server and the client. Be sure to verify the existence of a particular font on both the client and the server before saving a report in the EXL2K format. YY, Y, M, D, JUL, and I2MT. Any date format with a Q (quarter). Any packed-decimal (P) date formats. Any alphanumeric (A) date formats. Multiple format options. Only single format options are supported when using FORMAT EXL2K. For example, the formats I9C and I9B are supported, but I9BC is not. In order to use a dash (-) as a separator between month, day, and year in Excel, you must change the default date separator for Windows®. This setting can be located under Regional Options in the Control Panel. The power of EXL2K format derives in large measure from its ability to take advantage of PivotTables. The PivotTable is a tool used in Microsoft Excel to analyze complex data much like the OLAP tool in WebFOCUS. It allows you to drag and drop data fields within a PivotTable, providing different views of the data, such as sorting across rows or columns. Report requests can be created within WebFOCUS and sent as output to a fully formatted Excel PivotTable. The ON TABLE PCHOLD FORMAT EXL2K PIVOT command will generate an Excel PivotTable in your browser, as shown in the following image. The first data stream is the PivotTable file. The PivotTable file (.xht) is an HTML file with embedded XML. The HTML file contains all the information that appears in your browser. The second data stream is the PivotTable cache file (.xml). The PivotTable cache file is a metadata type of file. It contains all the fields specified in the procedure and links internally to the PivotTable file. The PivotTable cache file can contain data fields called CACHEFIELDS, which populate the PivotTable toolbar, but do not initially appear in the report. CACHEFIELDS can be dragged and dropped from the PivotTable toolbar into the PivotTable when required for analysis. For more information about PivotTables, see the Creating Reports With WebFOCUS Language manual. After selecting the Car data source to report against, open Report Painter. In the heading area, type CAR File PivotTable. Press the Enter key to add another line to the heading, and type Sum of Sales by Car. 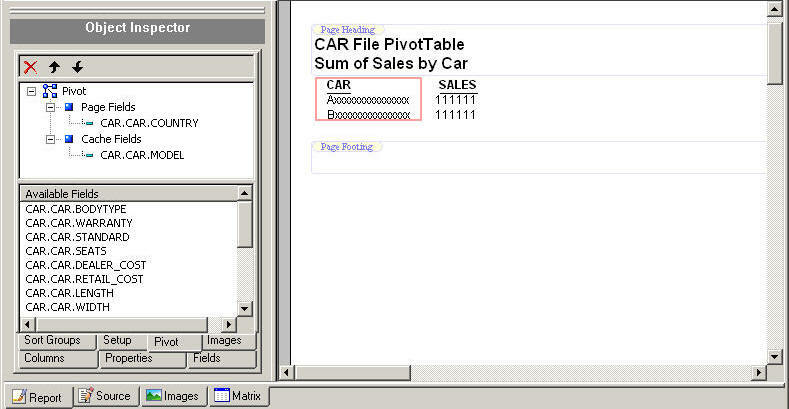 Move the insertion point to the report and add the following fields from the Object Inspector: SALES and CAR. Select the CAR column and click the By button. Ensure that the SALES column is a Detail field. Note: The PRINT command must be used. The PivotTable is generated by the PRINT command in combination with the BY, ACROSS, PAGEFIELDS and CACHEFIELDS phrases. See Choosing a Display Format in the Creating Reports With WebFOCUS Language manual. Select Excel 2000 PivotTable from the Output Format toolbar drop-down list. The Object Inspector opens at the Pivot tab and shows the Available Fields list, as shown in the following image. Click COUNTRY in the Available Fields box and drag it to the Page Fields dimension in the Pivot hierarchy. Click MODEL in the Available Fields box and drag it to the Cache Fields dimension in the Pivot hierarchy. The report displays the PivotTable in Excel 2000. All fields (including PRINT, BY, and ACROSS fields, and PAGEFIELDS and CACHEFIELDS) appear in the toolbar, as shown in the following image. Note: Text fields and Timestamp fields may not be used in Excel PivotTables. In addition, ensure that there is no missing data for any fields. The EXL97 format allows you to view reports in Excel 97, which supports full styling and drill-down capability. When you specify EXL97 format, an HTML-based file is generated with an extension of .e97. The appropriate MIME type is automatically assigned to designate Excel as the active application for this file type. When using the Microsoft Internet Explorer browser and Excel 97, the Excel client opens in the background and the report launches in your browser. You may see the Excel application open and minimize while viewing your report. Leave Excel open when viewing the spreadsheet. After the report is generated, you can save the document as an Excel spreadsheet locally on your PC. In Excel 97, you will be prompted to save the document as a Microsoft Excel Workbook with an .xls extension. This will save the file as a binary Excel document. For more information about Excel 97 format, see Choosing a Display Format in the Creating Reports With WebFOCUS Language manual. Format EXL97 is fully compatible with Excel 2000 and Excel 2002. Note: Although format EXL97 is available, there are some limitations when compared to the Excel 2000 (EXL2K) format. See Limitations for FORMAT EXL97. Future enhancements in the area of Excel integration will primarily be made to the EXL2K format. We recommend upgrading to Excel 2000 or higher so you can take full advantage of our Excel integration, as well as all future enhancements. After selecting the Centord data source to report against, open Report Painter. In the heading area, type Plant Revenue in Excel 97 Format. Move the insertion point to the report and add the following fields from the Object Inspector: PLANTLNG and LINEPRICE. Select the Line Total column in the Report Painter window and click the Sum button. Select the PLANTLNG column and click the By button. Select Excel 97 from the Output Format toolbar drop-down list. Run your report. The output is shown in the following image. This format is only compatible with Excel 97 or higher. This format is not compatible with Excel 95 or any versions of Excel prior to Excel 95. Excel 97 does not support Cascading Style Sheets (CSS). Any styling specified in a report that uses CSS (SET HTMLCSS=ON) will not be respected in Excel 97. The WRAP=n feature is not supported with EXL97 since this feature requires CSS. WebFOCUS uses nested HTML tables when generating a heading, which may cause a problem in EXL97. As an alternative, specify HEADALIGN=BODY in your stylesheets for all HEADING objects, include FOOTING, SUBHEAD and SUBFOOT commands. This creates the heading as a separate table. Page numbers appear by default and are placed in the heading. We recommend that you turn page numbering off (SET PAGE-NUM=OFF). All numeric and date formatting options that are not supported for EXL2K are also not supported for EXL97. In addition, negative numbers displayed with brackets, trailing zeroes after the decimal, and leading zeros will not appear with EXL97 reports. Note that dates are typically translated into the Excel General format, which can cause problems with sorting and other Excel features. If you are using a Netscape® browser, you may have to assign the .e97 extension to the Excel MIME type manually the first time you run a report.